Starring Will Ferrell, Mark Wahlberg, Samuel L. Jackson, Dwayne Johnson, Steve Coogan, Rob Riggle, Damon Wayans Jr.
Action meets comedy in this offering from the respected McKay-Ferrell partnership. This film, with it’s really strong cast, offers up more laughs than you would expect. 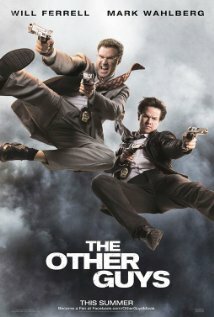 The Other Guys stars Will Ferrell and Mark Wahlberg as cop duo Allen Gamble and Terry Hoitz. Both are at the bottom of the theoretical cop food chain, and while Allen is more than happy being there, sat behind his desk, Terry is itching to get out the office and into the action. When top dogs Highsmith (Jackson) and Danson (Johnson) die in the line of duty, Terry sees a chance to make him and Allen the new kings of the police force. They manage to agree to take on a seemingly meaningless scaffolding permit case involving capitalist David Ershon (Coogan), however they soon discover there’s more to the case than meets the eye. This story isn’t really offering anything new. It is, as you can imagine, a good cop – bad cop story where one can’t stand the other, but needs him to achieve what he wants. Fairly cliché and stereotypical. What McKay and Henchy have done here, and many of their previous comedies, is created a story with just enough turns to make it interesting, while leaving as much scope as possible to allow the comedic leads to ‘do their thing’ as it were. That’s not to say that all the jokes actually worked though – the whole ‘Eva Mendes being Will Ferrell’s wife’ joke is funny for maybe the first minute, past that it is forced beyond belief and at some stages just uncomfortable. That is one black mark on what is otherwise a solid comedy on all fronts. What makes this film work is the relationship between Gamble and Hoitz – aka Ferrell and Wahlberg. While very stereotypical characters, Ferrell and Wahlberg create personalities that bounce off of each other spectacularly well. These are two very respectable comedic actors, and while there isn’t necessarily anything ne, these two do perform at their best. Specific mention should go to Mark Wahlberg, who I personally think is much funnier in The Other Guys than he is in Ted. This film is rife with experienced comedians, but the performances by Riggle and Wayans are not as strong as I’ve seen them in other films and TV. Maybe their characters are not as good in this, but they could have both been funnier regardless, I think. On the other hand, I was really impressed by the fair-sized cameos by Sam L. Jackson and ‘The Rock’ Johnson, both of whom were very funny – and what an exit, right? The directing in this film is actually quite good by Adam McKay! Often when it comes to comedies, the directing side is not really taken into account, often resulting in very average directorial performances. However, The Other Guys has plenty of action sequences where good directing is essential – and I can’t personally think of many occasions where McKay got it wrong in this film. This is a film that might not offer anything new, and might not be the best. However, The Other Guys definitely has enough about it to challenge the likes of Anchorman and Ted in the comedy stakes. Fans of the actors and directors previous work will definitely not be disappointed by this offering!